Saint-Raphael in the South of France 1938. 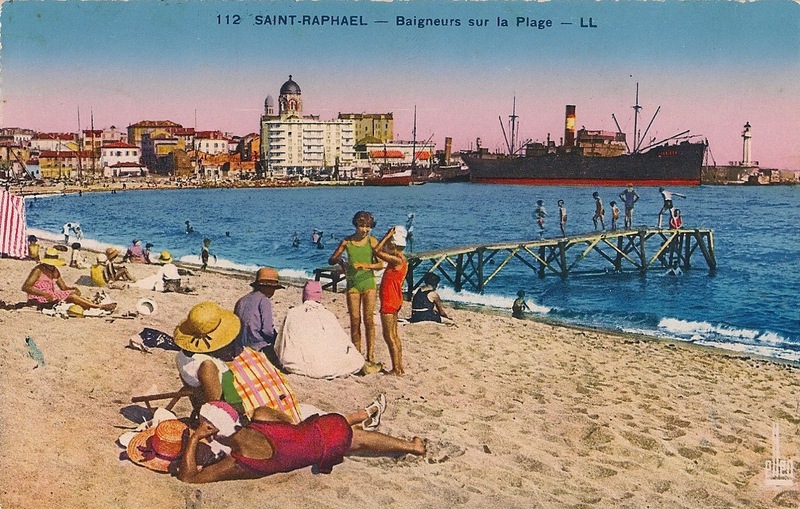 Some while ago I did a post about a postcard sent from Saint-Raphael in the South of France in 1939, two months before the outbreak of the Second World War. 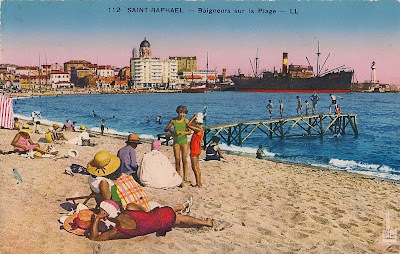 This has led a friend to send me another postcard sent from Saint-Raphael, this time in 1938. So now I have two views of Saint-Raphael before the war, this one less chic than the first; it looks like something of a workaday port, though it does possess several fine sandy beaches. 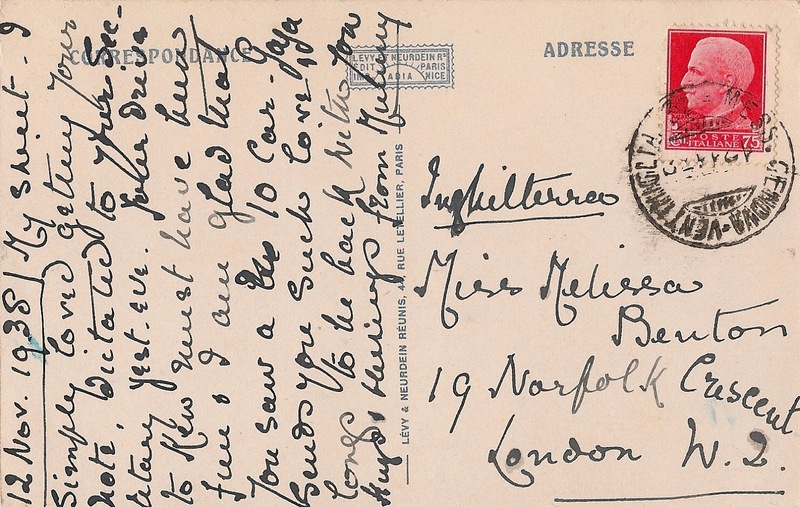 But as I said in my earlier post, old postcards make me curious. They are small pieces of the past, ostraka you might say, or shrapnel, and they almost always have something interesting to say. Operation Dragoon in the South of France 15 August 1944. It turns out that the commune of Saint-Raphael was the landing place for Napoleon Bonaparte and his forces when they arrived by ship from Egypt in 1799 prior to his coup d'état in Paris. Saint-Raphael also played a significant role in the Second World War. 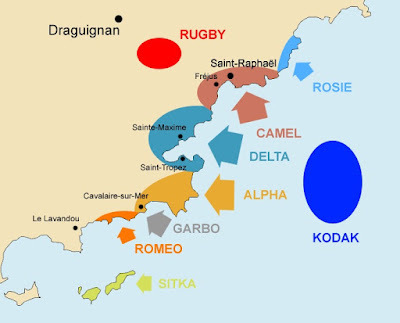 On 15 August 1944 it was the landing place for Operation Dragoon, the American, British and French attack against the Germans who until then still occupied southern France. Little is heard about Operation Dragoon as it has been overshadowed by the larger landings at Normandy two months earlier. Nor was it popular with the British; Winston Churchill wanted to land in the Balkans in order to deny as much of Eastern Europe to the Soviet Union. But by 1944 the Americans were sending more troops than the British into the war against Germany and the decision to go ahead with an attack in southern France fell to American generals, not Churchill, who according to an apocryphal story complained he was dragooned into the operation, hence its name. 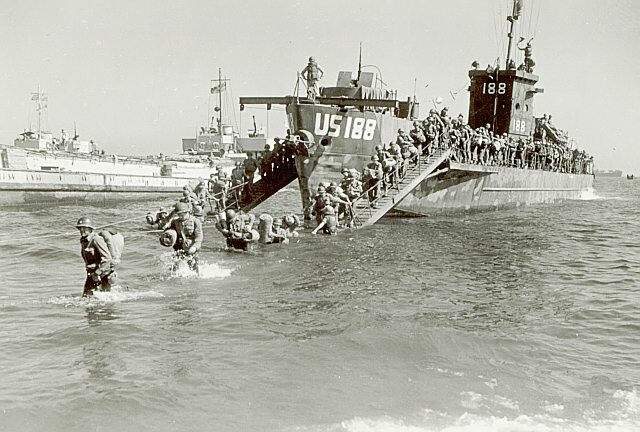 American soldiers coming ashore in Operation Dragoon. Stiff German resistance was expected but in the event the German defences quickly collapsed. So sudden was the Allied victory that the planners had not provided enough petrol to make a rapid advance thus allowing the bulk of the German army to retreat into the Vosges mountains far to the north. What ultimate strategic benefit Operation Dragoon had is not clear to me but it certainly made the French feel good. Within two weeks all of France as far north as Grenoble was free; on 28 August Free French forces liberated Marseille and Avignon. 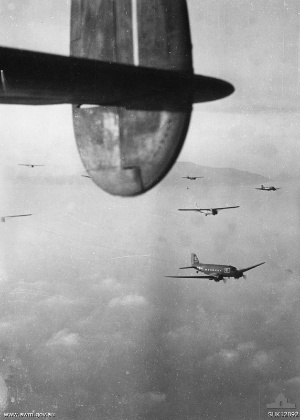 from gliders towed by American C-47s. But back to the postcard. 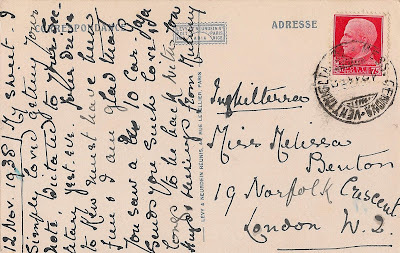 As you see on the reverse it was sent by 'Mummy' to 'My Sweet', her daughter Melissa Benton at 19 Norfolk Crescent, London W2. Mummy is responding to a letter just received from her daughter, a letter dictated by her daughter to her secretary. 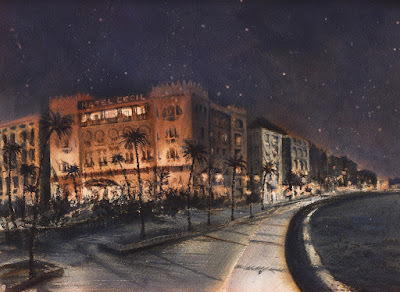 Mummy was travelling with Papa and had bought the picture postcard at Saint-Raphael but they had kept moving east, into fascist Italy, and she eventually sent it from Ventimiglia. I have never been to Ventimiglia and the only thing I know about it comes from a letter by E M Forster written in 1917 from Alexandria in Egypt while he was there during the First World War. 'As an escape from the war Alexandria is matchless: or rather escapes', Forster wrote to Robert Trevelyan in August 1917. 'The Syrians dance. The Bedouins lay eggs. The French give lectures on Kultur to the French. The Italians build il nostro Consolato, nostro Consolato nuovo, ricco, grandioso, forte come il nostro Cadorna, profondo come il nostro mare, alto come il nostro cielo che muove l'altre stelle, e tutto vicino al terminus Ramleh Tramways. The English have witnessed "Candida" or "Vice Detected"'. But Forster's preferred escape was the Greek, 'for the Greeks are the only community here that attempt to understand what they are talking about, and to be with them is to reenter, however imperfectly, the Academic world. They are the only important people east of Ventimiglia --: dirty, dishonest, unaristocratic, roving, and warped by Hellenic and Byzantine dreams -- but they do effervesce intellectually, they do have creative desires, and one comes round to them in the end'. Of the Greeks he singled out Cavafy: 'with much help I have read one or two [of his poems] and thought them beautiful'. All that is another story, however; back to the postcard of Saint-Raphael sent from Ventimiglia to 19 Norfolk Crescent in London. I have had a look at Norfolk Crescent on Google Street View; it possesses a rim of unattractive houses clearly built after the war. I wondered what had happened to the houses that had stood there in the time of Mummy and Papa and My Sweet. It is said of London that the greatest damage done to it has been by town planners, greater than anything done by Hitler, and that is true. Urban planners should be shot at birth. Nevertheless it is true that the German bombing of London did great damage and I thought I should check to see if Norfolk Crescent was a victim. 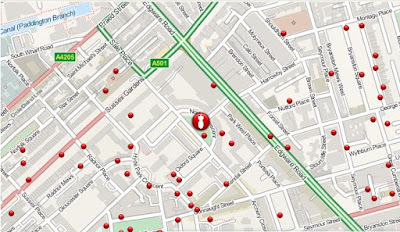 There is an excellent website for this where you can see where the bombs fell. 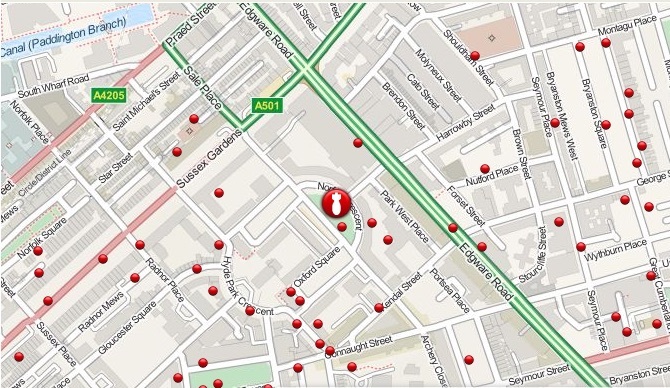 And sure enough Norfolk Crescent was blown to smithereens one night by a high explosive German bomb. Norfolk Crescent off Edgware Road is at the upper left. Marble Arch is at bottom centre; Selfridges is on Oxford Street which runs off to the right. Maybe Mummy and Papa Benton were at home that night. Maybe their daughter Melissa was there too. Maybe they were all killed by that German bomb. I have tried to find out but have learnt nothing. All I have, as usual, is the postcard. 19 Norfolk Crescent London W2. The bomb fell during the week of 7-14 October 1940. I have been seeing a lot of Mary Magdalene lately. In writing my book The Quest for Mary Magdalene I have been looking for what can be discovered of the real woman, the historical figure, such as might be found of her in the few but highly significant references to her in the gospels. 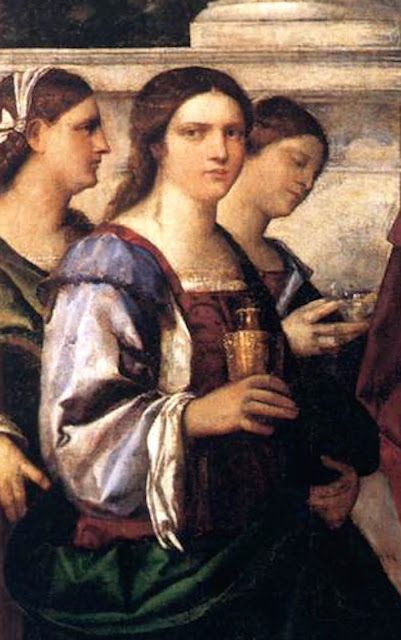 But that has been only part of the quest, for Mary Magdalene is most of all a woman whose identity has been formed in later centuries by the Church to suit its changing ideology and also by the popular imagination. 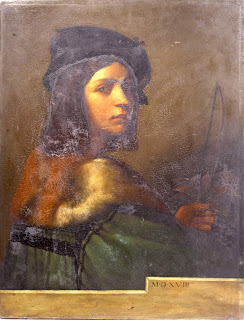 Sebastiano del Piombo self-portrait 1518. At any rate I have been seeing a lot of Mary Magdalene lately, looking at thousands of images of her. 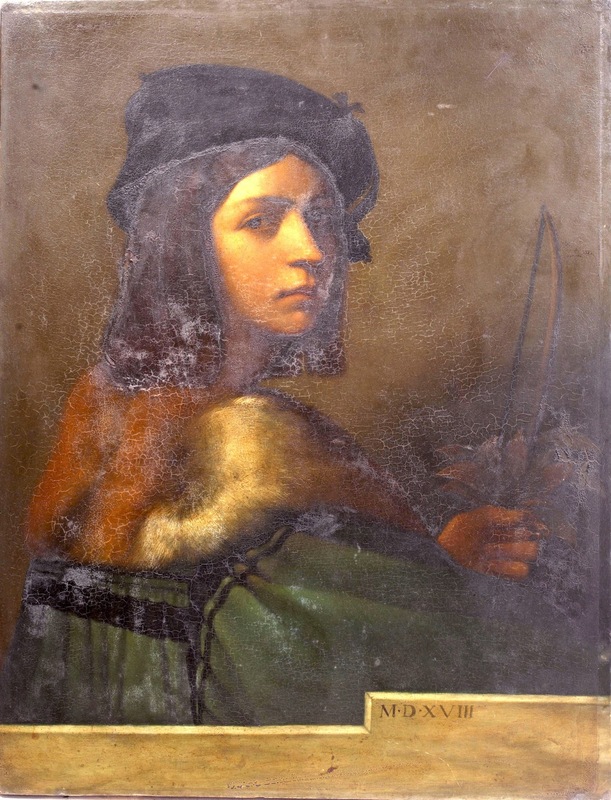 And in doing so I have discovered a painter I had not known before, Sebastiano del Piombo (1485-1547). He was Venetian but was much in Rome where Michelangelo worked with him hand in glove, Michelangelo admiring Sebastiano's command of colour; in several paintings, according to Vasari, Michelangelo provides the line and Sebastiano provides the brilliant Venetian sense of colouring. But I like Sebastiano's line as well. His figures are at once monumental and contained, sensual and spiritual. He began life as a musician, mostly a solo player on the lute, then turned to painting. His first work that drew wide attention turns out to be the one including Mary Magdalene that I have shown in a previous post that was done for the church of San Giovanni Crisostomo in Venice. 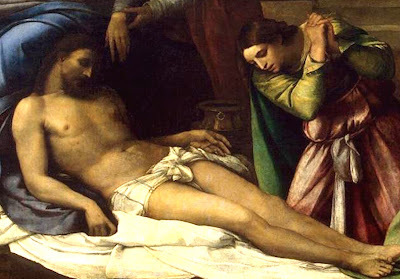 Another Mary Magdalene is the one below, a detail of the deposition of Jesus' body from the cross. Painted in 1516 it is now at the Hermitage in St Petersburg. Once again Mary Magdalene has a contained and powerful feminine presence, a sensitivity and a knowing. Sebastiano is not much noted these days, an oversight that I intend to correct for myself by looking more into his life and work. The Deposition by Sebastiano del Piombo. The following is a talk I gave at the International Lawrence Durrell Society conference at Victoria, British Columbia, in 2006. It explains how Durrell intended to write a single-volume work set in Alexandria and how it turned into a quartet. 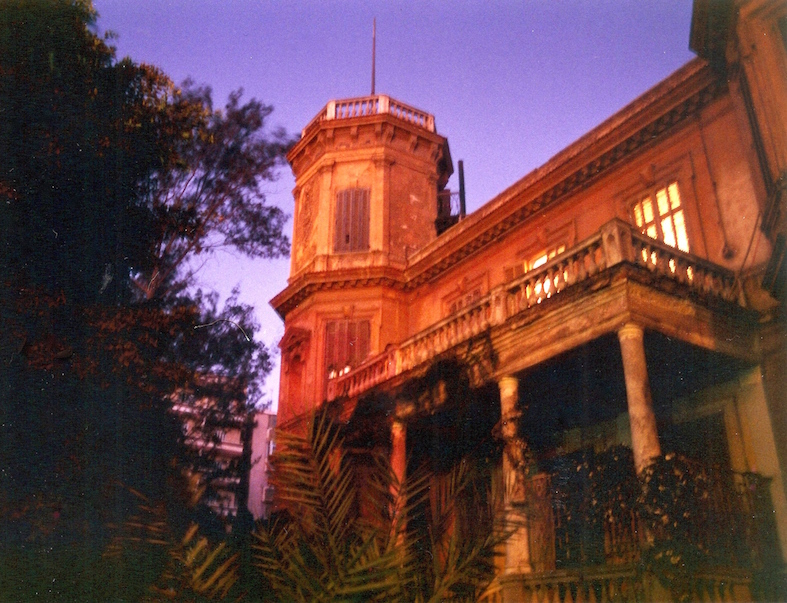 My photograph taken in 1996 of the tower atop the Villa Ambron where Durrell wrote Prospero's Cell and the first few pages of The Alexandria Quartet. Lawrence Durrell made a number of corrections to Justine following its first publication early in 1957. Most famously there was the misprint on page 136 in this description of Melissa: ‘She will throw back her dress to unroll her stocking and show you the dark cicatrice above the tree, lodged between the twin dimples of the suspender’. ‘Tree’ was changed to ‘knee’ in October that year, but not before it had played havoc with the French translation of Justine. A year later, in November 1958, Durrell made another set of corrections and alterations. The most interesting was in the Workpoints at the very back of the book among a series of impressions of the Graeco-Roman Museum in Alexandria, where we find for example: ‘Ushabti … little serving figures which are supposed to work for the mummy in the underworld.’ ‘Lioness Holding a Golden flower.’ ‘Aurelia beseeching Petesuchos the crocodile god.’ To this last remark Durrell added a single word, so that it now read: ‘Aurelia beseeching Petesuchos the crocodile god. Narouz’. By this time, November 1958, the first three volumes of The Alexandria Quartet had been published, and Narouz had emerged as a major figure. At the Carnival Ball, the climactic scene in Balthazar, it is Narouz who drives the hat pin into the skull of Toto de Brunel thinking he is murdering Justine. And in Mountolive the climactic scene is the death of Narouz. Yet until Durrell added the name Narouz to the Workpoints of Justine, there was no mention of him at all in the first volume of the Quartet. In fact looking through Justine not only will you find no mention of Nessim’s brother Narouz, but you will find no mention either of Nessim’s mother Leila nor of Nessim’s father Faltaus nor of Nessim’s family estate at Karm Abu Girg. There is a good reason for this. At the time Durrell was writing Justine he was not looking ahead to the structure or the plot or the characters of the remaining volumes of the Quartet for the simple reason that he had no intention of writing a quartet. 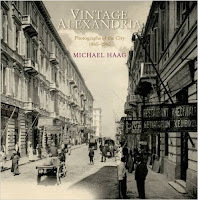 Yet afterwards Durrell would say that he had always intended to write a quartet of books about Alexandria. For example in a 1970 NBC television interview with Edwin Newman, Durrell said, ‘I had planned four books’. He also said as much in his interviews with Jean Fanchette in Two Cities in 1959 and with Marc Alyn in The Big Supposer in 1972. But this was untrue. The first indication Durrell gave of wanting to write more than a single volume came a few months after Justine was accepted for publication when he wrote to Faber and Faber in mid-July 1956, ‘In the back of my mind I want to do a series, I don't know how many, of novels in the style of Justine about Alexandria, using the same people in different combinations'. Indeed up until at least a month before the publication of Justine in January 1957 Durrell’s ideas were so unformed that he wrote to Henry Miller saying he was thinking of writing five Alexandrian novels. Coloured drawing by Greek artist Andrea Georgiadis of the Hotel Cecil on the Corniche. What had decided Durrell to go beyond writing just one Alexandria novel? He revealed something of the truth when he wrote at the beginning of the second volume, Balthazar, 'A single chance factor has altered everything, has turned me back upon my tracks. Justine, Melissa, Clea. There were so few of us really — you would have thought them easily disposed of in a single book, would you not? So would I, so did I’. In the novel, of course, that factor is Balthazar, whose Interlinear reinterprets the events described by Darley in Justine. But in reality that single chance factor was Claude Vincendon who arrived in Durrell’s life with an Interlinear of her own. Very little has been known or written about Claude Vincendon’s origins. 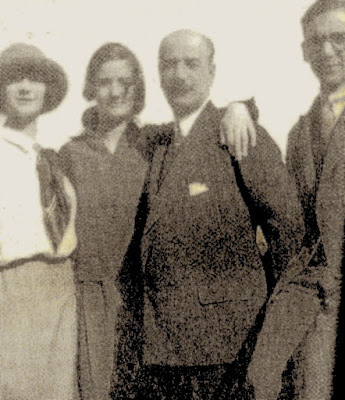 In his biography of Durrell, Gordon Bowker says only that Claude was ‘the daughter of a French banker and a Jewish mother’, while Ian MacNiven, in his biography, does not go beyond saying that her mother was ‘a Menasce, a family prominent in Egyptian banking’. Even Durrell’s daughters and his closest friends, some of whom became close friends of Claude, knew next to nothing about her background. Neither Durrell nor Claude herself talked about her past; it remained something private between them. Claude and Durrell met in the summer of 1955 when she applied for a position at the French section of the Cyprus Broadcasting Corporation and was hired by Durrell, who was the Public Information Director. Durrell had fallen into 'a bad patch of distress and apathy' after the departure of his wife Eve and their daughter Sappho. But Claude inspired him not only to finish Justine but to expand what till then he had intended as only a single novel into a quartet, its span the interwar years and the Second World War in Alexandria, bringing something to it of her own memories of the city as well as characters and stories from her family history. My photograph of the view from Athineos on the Corniche across the Eastern Harbour to Fort Kaitbey, site of Alexandria's ancient lighthouse the Pharos, one of the Seven Wonders of the World. For all its ancient glory, Alexandria had been reduced to a miserable village of five thousand inhabitants when Napoleon landed near by in 1798. What brought Alexandria back to life was the construction of the Mahmoudiya Canal in 1820 by Mohammed Ali, an ambitious and Westernising Ottoman adventurer from northern Greece who made himself master of the country after Nelson forced Napoleon's withdrawal. The canal, which linked the Nile with the city's Western Harbour, gave Alexandria access to the reorganised potential of the Egyptian hinterland and brought Egypt again face to face with the sea. With the aim of attracting foreign capital and expertise, Mohammed Ali also granted land for settlement to the Greek, English, French, Armenian and other communities in the centre of his new city, whose Western Harbour he enlarged, making it the largest in the Mediterranean. Within a century Alexandria's population grew to nearly half a million, about what it had been in Cleopatra's time, and many foreigners, mostly Greeks and Italians, but also Jews, Syro-Lebanese and others had planted their family roots there, so that all of what is now central Alexandria and the coast eastwards towards Montazah became a cosmopolitan town. This was the world to which the Menasces, who were Sephardi Jews, belonged. The family came to Egypt via Aleppo, the great entrepot city of northern Syria, where spices, fabrics, precious metals and gems brought on the backs of camels from the East were traded for European manufactures. Both there and in Cairo, where the Menasces settled in the eighteenth century, Jews played a major role as merchants and moneylenders, virtually controlling the markets and concentrating the entire caravan trade in their hands. Claude’s great great grandfather, Yaqub Levi Menasce, was born in 1807 in the Haret el Yahud, Cairo's Jewish quarter, immediately west of Khan el Khalili, the famous bazaar in the heart of the city, from where he rose to become the private banker of the Khedive Ismail. One of the earliest businessmen in Egypt to recognise the opportunities offered by European trade, he founded the international banking house of J L Menasce and Sons. The 'de' was added in 1876 when he obtained Hungarian citizenship together with the title of baron of the Austro-Hungarian Empire for promoting trade between the Adriatic and the Levant. In 1871 he moved from Cairo to Alexandria, where he founded a new synagogue, built a Jewish school and established a Jewish cemetery. The banking firm of J L Menasce passed to Yaqub's four grandsons, among them Claude’s grandfather Baron Felix de Menasce. The brothers were sent to Europe for their education and to manage the bank’s various overseas branches before returning to Alexandria. In Egypt they acquired extensive lands for the cultivation of sugar and cotton, and they constructed water works and railways – indeed together with three other Jewish families, the Menasces were responsible for building almost the entire railway system of Egypt. Baron Felix de Menasce with his daughters Claire and Denise and his son Jean. Alexandria in the 1920s and 1930s was culturally the most brilliant and sophisticated city in the Mediterranean, though its true brilliance was to be found not so much at its opera or theatres but in its great houses, where families presented exhibitions, lectures, concerts and theatrical entertainments. Celebrated among these was the great rambling house of the Baron Felix de Menasce and his flamboyant wife Rosette. Here his older son George de Menace gave weekly piano concerts, often accompanied by like-minded friends, and also displayed his remarkable collections of late Roman ware, Roman and Syrian glass, Mogul jewelled jade, Jaipur enamel, Persian jewels, coloured diamonds, jewelled watches and automata, eighteenth century gold snuff boxes, Greek island and Turkish embroideries, fine paintings, rare carpets and Fabérgé. His greatest passion, however, apart from music, was for Chinese works of art, especially porcelain, in which he built up a collection that was perhaps the finest and most extensive in private hands anywhere in the world. 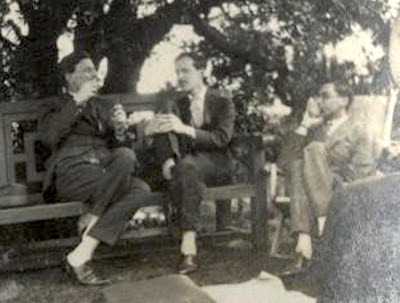 Siegfried Sassoon, Lord David Cecil and Jean de Menasce in a snapshot taken by Lady Ottoline Morrell. Here too Felix de Menasce’s younger son Jean would stay with his family on his returns from Europe where he would speak of his friendships with a wide variety of literary figures. Among them was Constantine Cavafy, whose work he promoted while he was at Oxford, publishing four translations in Oxford Outlook in 1924, and also T S Eliot, who called him ‘my best translator’: Jean did The Waste Land and later Ash Wednesday, East Coker and other of Eliot’s works into French. After leaving Oxford Jean went to the Sorbonne to study oriental languages and under the influence of the philosopher Jacques Maritain converted to Roman Catholicism, became a Dominican, and published several valuable works on Persian inscriptions. Felix and his wife Rosette's two daughters lived in the house as well, Denise until she married a barrister and Claire for several years after her marriage to Jacques Vincendon, who was made secretary general of the Land Bank of Egypt by Felix who was director. Claire Vincendon's passion was the theatre, which was how most other people got to know her; she acted in and designed costumes for the entertainments she staged for guests at the great rambling house on the corner of the Rue Rassafa and the Rue Menasce, where her daughter Claude was born in 1925. In fact Durrell had had a glimpse of Claude’s world. Though they never met in Alexandria, he would sometimes go to the Menasce house to attend the renowned open-house musical afternoons put on every Sunday and Tuesday during the war by her uncle George de Menasce, each attended by as many as two hundred soldiers and other guests, followed by a lavish tea with pastries from Baudrot or Pastroudis. 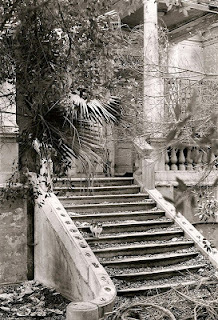 Indeed the Menasce house was only a five minute walk away from the Villa Ambron where Durrell lived and had his tower. 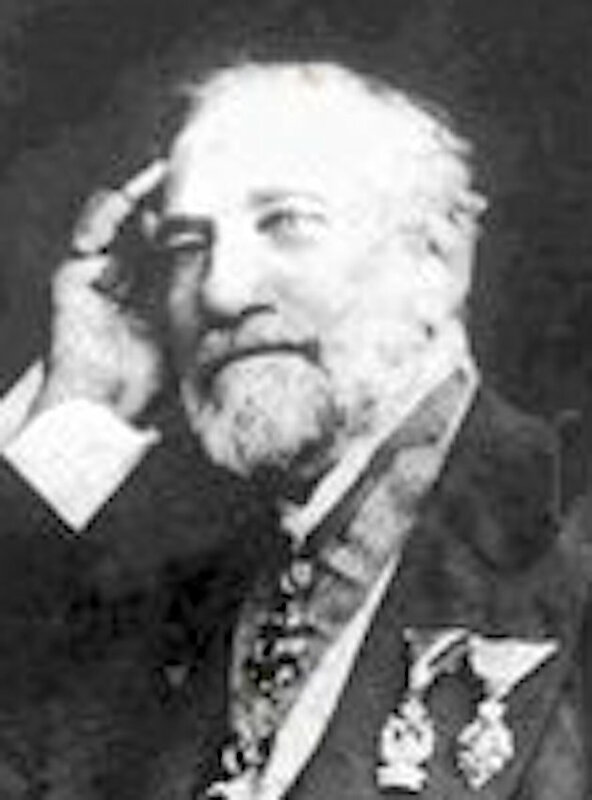 Aldo Ambron was an architect, an engineer and a financier who sat as a director on several companies along with other captains of Alexandria’s thriving business community and who for the most part were members of the city’s most prominent Jewish dynasties, among them Baron Felix de Menasce. In fact it was Aldo Ambron Abramo Isaac, to give him his full name, who in a eulogy in the press led the tributes to Felix de Menasce when died in 1943 after paralysis had confined him for nearly a decade to a wheelchair in the great house just along the Rue Rasafa. 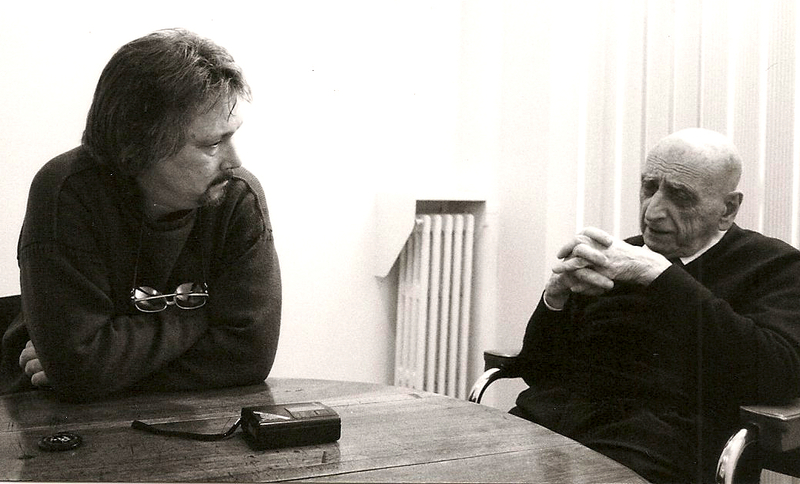 Aldo Ambron on the left. 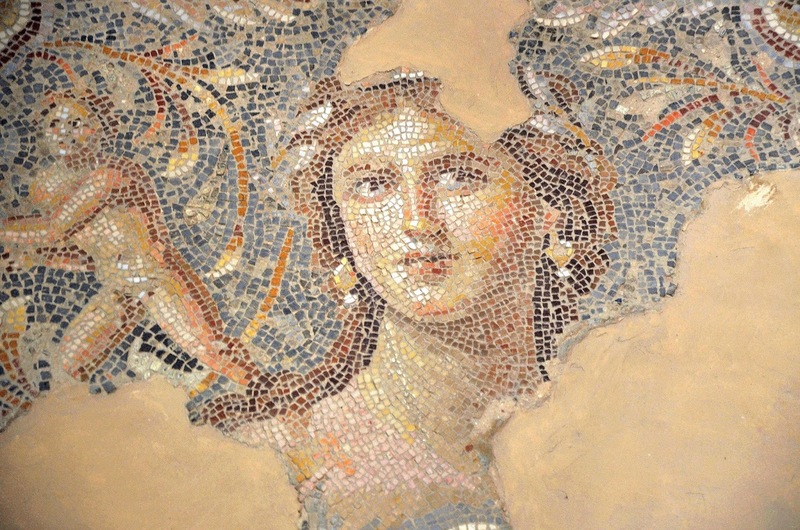 Durrell wrote of Alexandria being a plangently Greek city, but the Alexandria of his experience was at least as much Jewish, and moving into the Ambron villa brought him to the heart of Alexandria’s haute juiverie. And the most fervent believers in cosmopolitanism were Alexandria’s Jews for the simple reason that unlike the Greeks, the Italians and all the rest, they had no country to call their own. Among the people Durrell got to know in Alexandria was Gaston Zananiri, a man of letters and a champion of cosmopolitanism. Zananiri also gave lectures on Cavafy, whom he first met when he was just twenty-two in 1926. Cavafy and Zananiri would frequent the tavernas and the cabarets. ‘He used to go spend the nights there and look at the young lads. And when he returned home he used to scribble notes about his impressions. You will see in some of his poems where he says old men lean on their memories'. 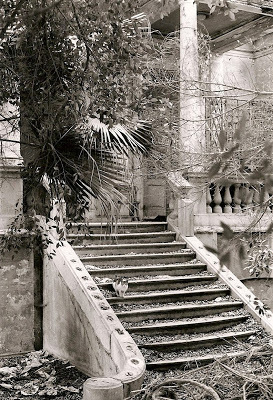 Zananiri would come to visit Cavafy in the Rue Lepsius where towards twilight they would sit on the balcony overlooking the gardens of the Greek Hospital and talk of Alexandria not again but still. 'For me Alexandria was a universe. Alexandria hadn't changed. 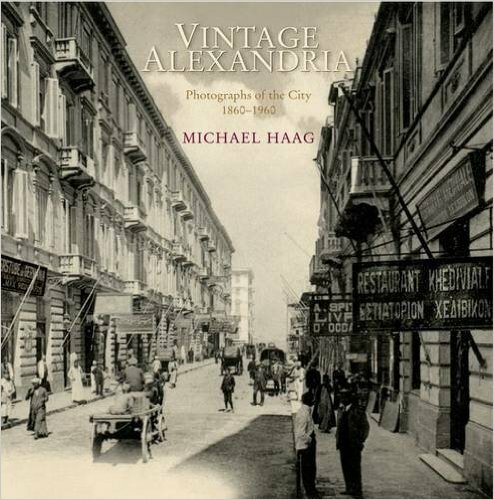 though Alexandria is two thousand years old, it's still Alexandria. There is something of the past which returns every moment'. And about cosmopolitanism Zananiri said, 'my idea has always been the world, ecumenism'. On his father's side his family were Syrian Greek Catholics who had settled in Alexandria in 1610, while his mother was Jewish from Hungary. 'I'm a mixture, as Alexandria was a Jewish, Greek and Syrian city'. Zananiri may well have been a partial model for Durrell’s Balthazar, whom he described as a 'close friend of the old poet, and of him he spoke with such warmth and penetration that what he had to say always moved me', a description fitting Zananiri, also the observation that Balthazar 'spoke as if a different sort of time obtained here'. And when Durrell wrote in Justine of the boys who stir and turn to watch every stranger 'in those little cafés where Balthazar went so often with the old poet of the city', Durrell was clearly recollecting Zananiri's stories of his nighttime adventures with Cavafy. I spent three days talking with Gaston Zananiri in Paris in 1996 shortly before his death, all of it captured on tape. Zananiri was a friend of Durrell's and Cavafy's and of the Menasce family. But Zananiri also played another role in Durrell’s impressions of Alexandria. Zananiri would say to Durrell, 'You ask me what I am? I am an Alexandrian. 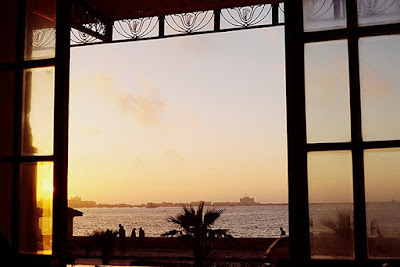 Alexandria is not Egypt, Alexandria is not Africa. When you are in Alexandria you are on the Mediterranean'. Durrell had been reading Zananiri's Egypt and the Equilibrium of the Levant in the Middle Ages published in 1936 and The Mediterranean Spirit in the Near East which appeared in 1939. Both books were contributions to the discussion in intellectual and political circles about where Egypt's future lay at a time when the question was still being asked who the Egyptians were and how their heritage should be defined. The answer would be critical, as those excluded from the definition could eventually lose their political rights and possibly their property, their homes and their country too. Zananiri’s hope for Egypt's future, his cultural and his political hope, was that it should follow the diverse yet inclusive Mediterranean model of cosmopolitan Alexandria. Throughout history, Zananiri wrote, Egyptians had played a role in the Eastern Mediterranean and the Near East and were themselves an essentially Mediterranean people, like the Syrians, Lebanese, Palestinians, Greeks, Italians and Maltese, many of whom – Muslims, Christians and Jews – had settled in Egypt. 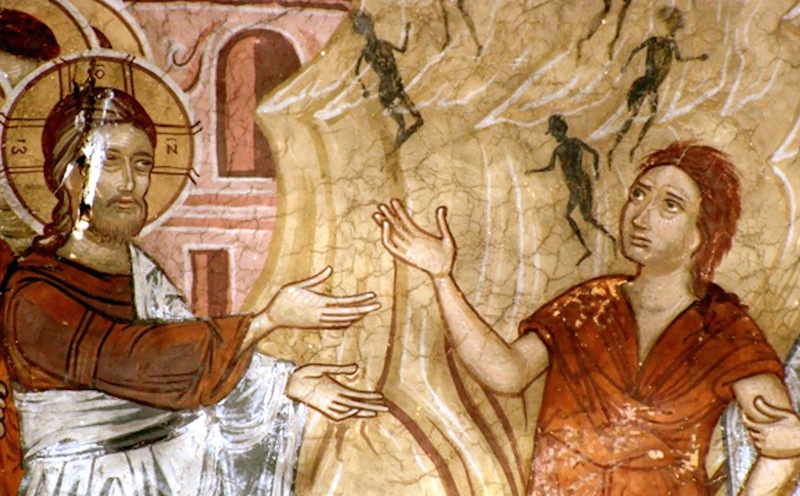 The Christians and Jews in particular had acted as a link between West and East and had largely inspired the social and economic development of Egypt and other countries of the Near East. Muslims from the Balkans, Turkey and Arab countries had been assimilated, but for the same process to take place for Jews and Christians they had to be free of the official discrimination and obstacles that prevented them from acquiring Egyptian nationality. Meanwhile they were fearful of the nationalistic mood of the authorities and also the trend towards pan-Islamism, which if ‘transposed into a political movement’, wrote Zananiri, ‘can easily become a sort of Oriental fascism’. Durrell had Zananiri’s typescript of The Problems of Egypt sent to Curtis Brown, his literary agents in London. They passed it on to Faber and Faber who returned it to Zananiri in Alexandria. It was never published. 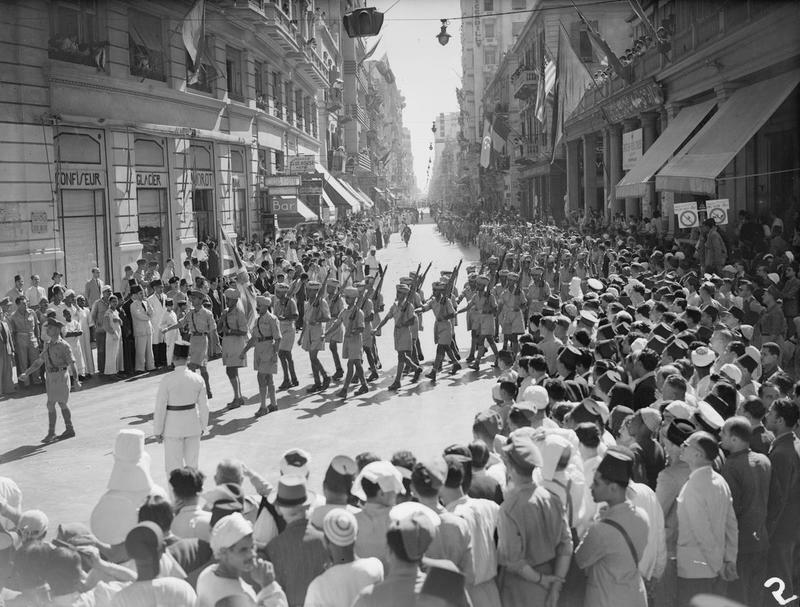 An detachment of Indian troops marches along the Rue Fuad on United Nations Day, 14 June 1943. On the left is Baudrot, a bar and restaurant on the corner with the Rue Cherif Pasha; Durrell worked at the British Information Office nearby and frequented Baudrot at lunchtime and after work. 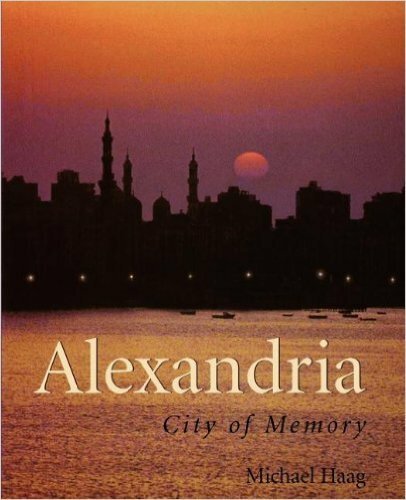 Meanwhile, recalled Durrell’s friend Gwyn Williams, who was head of the English department at Alexandria University, there was no mistaking that 'Alexandria during the years 1942-45 was a city of causes that were being lost, even though militarily it was successfully defended'. Instead of being linked to the Mediterranean it was being 'rolled towards the sea'. Seeing no future before them, many cosmopolitan Alexandrians left the city after the war. Durrell’s Jewish girlfriend Eve Cohen nearly did not make it: the Egyptian government told her that she was not a citizen and could not be granted a passport; no matter that her family had lived in Egypt for generations, she was declared a stateless person in her own country. 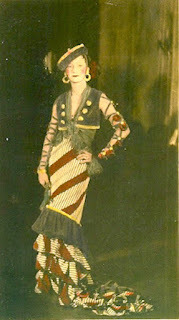 Claude Vincendon had French nationality through her father and left Egypt in 1946. Gaston Zananiri abandoned his Mediterranean dream and in 1952 left the country which had been inhabited by his family for three hundred and fifty years. 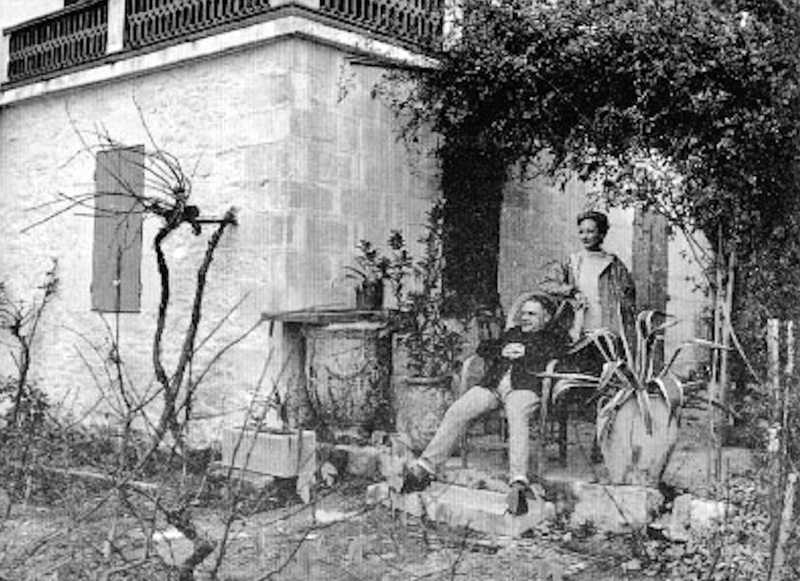 Durrell and Claude in Provence in 1957 where he writes what he first calls Justine II which becomes Balthazar, the second volume of the Quartet. In Balthazar, Mountolive and Clea, the last three volumes of The Alexandria Quartet, Durrell pursues the theme, absent from Justine, of the uncertain prospects of the minorities and foreigners in Egypt and of the Palestine conspiracy that drives the passions of the Coptic banker Nessim Hosnani and his Jewish wife Justine. '"Yes, Justine, Palestine. If only the Jews can win their freedom, we can all be at ease. It is the only hope for us, the dispossessed foreigners." He uttered the word with a slight twist of bitterness.' 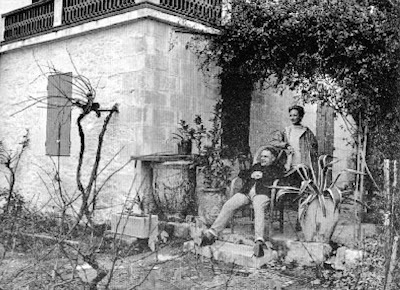 But that was only after Durrell met Claude Vincendon on Cyprus — Claude, the granddaughter of Felix de Menasce and the niece of George. Delivering her Interlinear, Claude told Durrell how in March 1918, four months after the Balfour Declaration, Chaim Weizmann, leader of the World Zionist Organisation and the eventual first president of Israel, sailed into Alexandria harbour and was cheered through the streets by a large and enthusiastic crowd of Jewish refugees who had been thrown out of Palestine by the Turks and Germans, and how he was greeted by numbers of Alexandrian notables led by Baron Felix de Menasce. 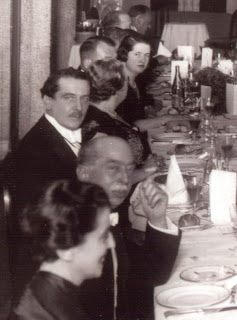 Weizmann and his wife became lifelong friends of Felix and Rosette, and whenever Weizmann returned to Alexandria he invariably was their guest. 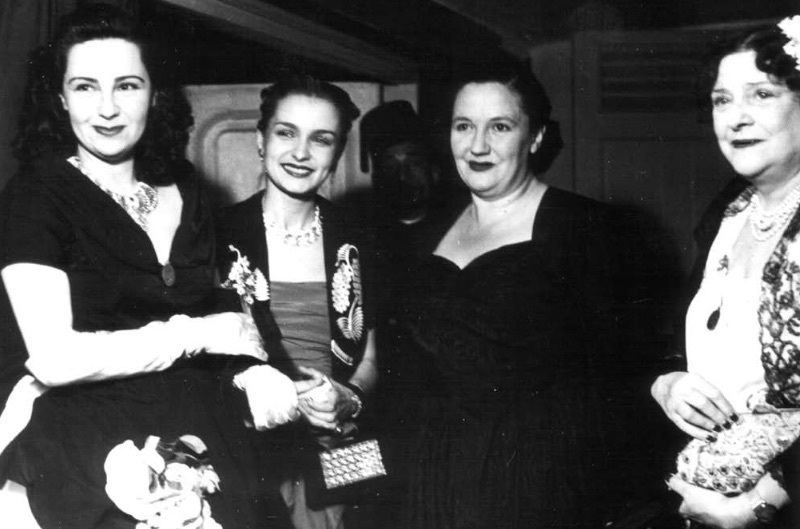 Princess Toussoun whose father in law Omar Toussoun was known as the Prince of Alexandria; Mrs Aly Yehia Pasha, wife of the wealthiest Egyptian cotton broker and financier; Gina Bachauer, the famous Greek concert pianist and friend of the Menasces; and Baroness Rosette de Menasce in Alexandria 1948. Felix de Menasce went to Jerusalem that summer where he was present as Weizmann laid the foundation stone for the Hebrew University, while back in Alexandria he helped found and became the first chairman of the Alexandria Pro-Palestina Committee whose purpose was to encourage and finance settlement in Palestine. He made large donations to the Jerusalem hospital, bought land atop Mount Carmel, represented Egypt at the London Zionist conference in 1920 and at the Twelfth Zionist Congress in 1921 at Carlsbad, and became a member of the council of the Jewish Agency, which succeeded the Zionist Commission and acted as a kind of autonomous Jewish government for Palestine. Felix’s sons pursued his interests. Jean de Menasce, in addition to his published work on Persian inscriptions, wrote a book on Hassidism whose teachings originally were a popularised form of the Jewish mystical tradition known as the cabala, was an active Zionist both before and after his conversion to Catholicism, and worked for Weizmann at the Zionist Organisation’s Geneva bureau. Like his father, George de Menasce was a banker and financier, and also an ardent Zionist and a close friend of Chaim Weizmann. A mild-seeming man in appearance and behaviour, he was nevertheless prepared to defy the British to ensure the creation of a Jewish state. In 1939, faced with the peril of a German war and not wanting to alienate the Arabs in the Middle East, the British had limited Jewish immigration to Palestine to seventy-five thousand over the next five years with no further immigration allowed without Palestinian Arab consent. But at the very time that Durrell was attending the musical afternoons at the Menasce house in Alexandria, George de Menasce was secretly raising money from a select list of Alexandrian Jewish millionaires on behalf of Mossad Le'Aliya, the underground organisation responsible for illegal immigration into Palestine. This was in contrast to the appeal to the Jewish community in Alexandria in December 1942 to donate funds care of Robert Rolo, the non-Zionist president of the community, to further the British war effort as the surest way of delivering the world from Hitler's tyranny. 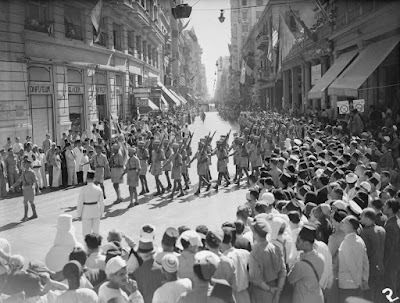 Associated with illegal immigration was the gathering of intelligence about the British and the Egyptians, and the theft from British warehouses of weapons and munitions confiscated from the retreating Germans which were then smuggled across Sinai to be used against the British and the Arabs in Palestine. British intelligence was watching George de Menasce, but they failed to pick up his activities at the time, and indeed for his open-house musical afternoons and other generous services to the troops he was awarded an OBE. The smashed-up entrance to the Villa Ambron. In the mid-1950s when Claude began living with Lawrence Durrell and as he was writing The Alexandria Quartet, Claude was herself writing a series of novels, one dedicated to her uncle George and which bore a prefatory remark: 'In common with other story-tellers, I have used true and fictitious ingredients. None of the characters is a portrait of any one person ... but some reflect facets of several personalities'. This was a nod towards the Quartet, in which Durrell was now drawing on Claude's knowledge of the city as he wrote about the Coptic Hosnani family — the crippled father, the beautiful mother, and the two Hosnani sons, one a financier, the other a religious mystic — and the cause in which their lives became involved, a Jewish Palestine that would stand as an ally with the Copts against growing Muslim power in Egypt. Except that inside Durrell's mind the models for the Hosnanis were not Copts: they were the brilliant flowering of cosmopolitan Alexandria; they were Jewish and their name was Menasce. For more information on cosmopolitan Alexandria see my books Alexandria: City of Memory and Vintage Alexandria. Two women of Galilee. Mary Magdalene being exorcised by Jesus of devils wearing baseball caps. 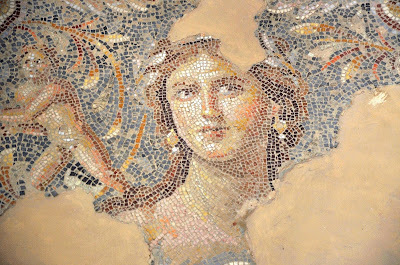 And a woman of a floor mosaic in Sepphoris who seems to be troubled only by cupid. One is Christian, the other is pagan. The Christians won and we are stuck with the baseball caps. Second century AD floor mosaic at Sepphoris in Galilee.